I’m not a hockey mom, but I have many friends and relatives who are. I remember my cousin practically living at the rink during hockey season when her boys were playing. They were always travelling to tournaments and practices. She was there at every game to cheer them on. 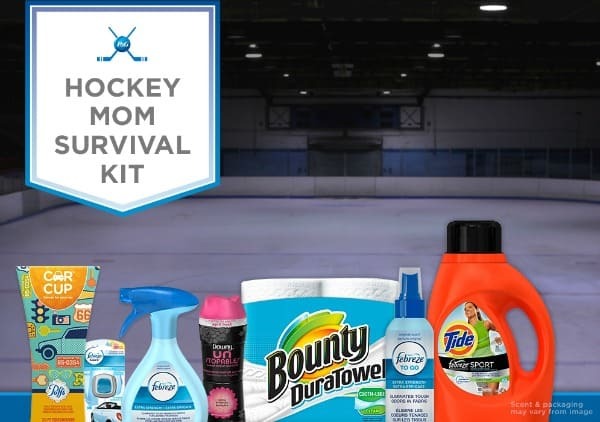 P&G has created the ultimate tip sheet to help out all the athlete moms and make their job a little easier. 1. Skates are expensive. To save blades from rusting wipe them down after each and every skate but be careful, they’re sharp. Try using Bounty Duratowels which are tough enough to wipe them off. For efficiency, keep a roll in hockey bags. 2. The lingering smell of hockey equipment in the car is only made worse when the heat is turned on high in the winter. To get rid of car odour, try Febreze Car Vent Clip Air Freshener for 30 days of fresh scent. 3. Runny nose after being in the cold arena? Coffee spill in the car? You’ll never have to search for a tissue with Puffs Car Cup – tissues specifically designed to fit in the cup holder of your vehicle. 4. Jerseys and socks soak up the sweat, snacks, beverages, and worst of all, the odour that comes with being an athlete. To keep their uniform looking bright and smelling fresh, throw them in the washing machine with detergent, specially designed for sportswear. Don’t forget to sprinkle in a little love and lasting scent with Downy Unstopables for freshness that releases as kids move! 5. Wet equipment left in a hockey bag after a game or practice is a breeding ground for odour-causing bacteria. To prevent odour, air out all equipment after every practice and game on a drying rack. After taking the equipment out of the bag, try spraying all equipment (even soles inside the skates) with Febreze Fabric Refresher Extra Strength for long lasting freshness. For a safety net, keep the to-go version in your purse for a burst of freshness anytime. Do you know a hockey mom? 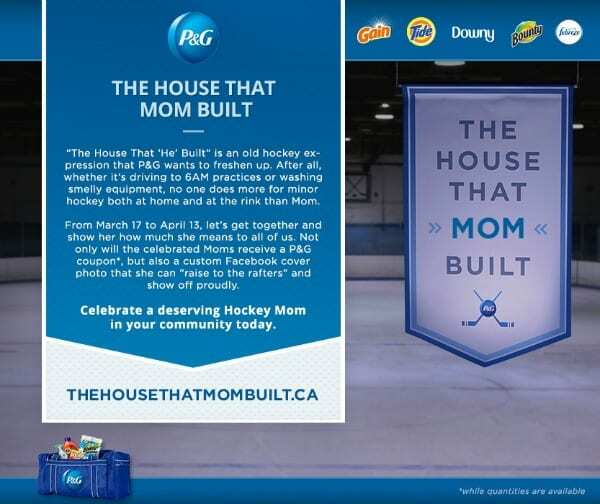 P&G recently launched The House that Mom Built website where Canadians can celebrate hockey moms they know whether you are one yourself or have a friend or relative who is one. Just enter the name of a mom you want to celebrate and you’ll receive an email that includes a custom Facebook banner for the hockey mom. You can also forward the email to the mom you are celebrating and let her know why you think she’s a great hockey mom! Sounds like fun doesn’t it? There’s also the #HockeyMomCA Twitter Party coming up on March 27th at 9 pm EST that will be hosted by Canadian Hockey Moms blogger, Theresa. They’ll be celebrating hockey moms, sharing tips and reflecting on the past hockey season. Make sure to RSVP if you are interested in attending! This is great! Very great for us hockey moms! Cant say enough how much I love those unstopables!! I am not a hockey mom but I have a good friend who is! I’m not a hockey mom but I AM a hockey fan! And I am also a big fan of P&G and all their products. 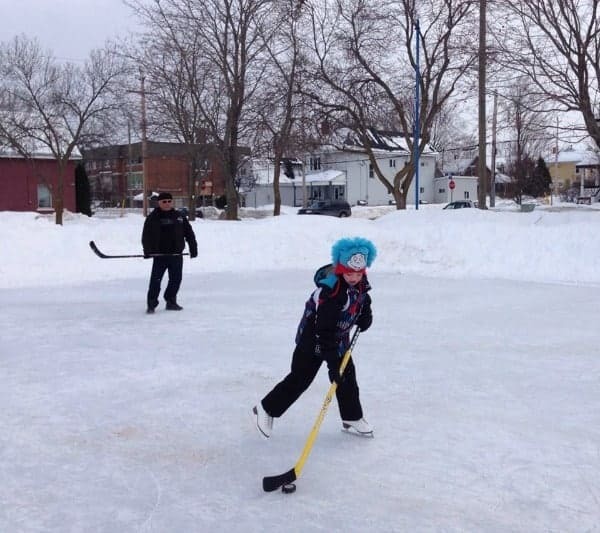 I’m not a Hockey Mom but several of my neighbours and cousins are. I know some great hockey moms! Know some friend’s hockey moms! I was a hockey mom but now I ‘m a hockey grandma.I still love it!! I’m a hockey wife!!!!! But many of my friends are definitely hockey moms. I have a husband that took up hockey in his adult years. Pretty fun! I have a great friend who is a hockey mom! I am not a hockey mom but some of my are.